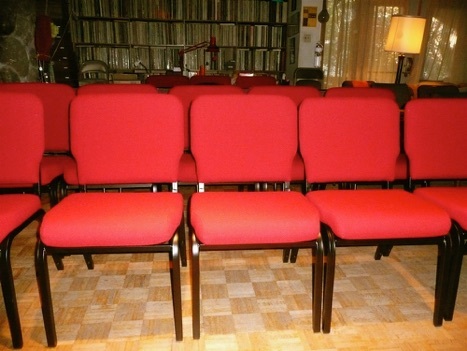 KWCMS Music Room - & How to Get Here Scroll down to see very precise driving directions to the Music Room from Highway 401 Scroll further to see some more of our nice new chairs....... And further yet to see simple requests re concert attire, noise, etc. - Newcomers, please read! -And further yet to see simple requests re concert attire, noise, etc. - Newcomers, please read! 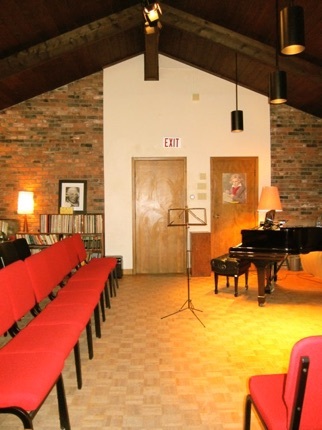 The KWCMS Music Room is in a specially built hall seating 85 in a home overlooking Waterloo Park. Note: do NOT confuse this with the Young Street in Kitchener - 2.5 km away! Note (1): the “google” map directions are confusing - DON’T Use them! 2.Continue on this until you come to the local expressway, which is numbered 85 and also 7 East. Note: IGNORE ‘7E’ after you get on this or you’ll end up in Guelph! 3.It goes overhead to the right and left and you’ll see it easily as you approach. 4.You take that highway by turning right onto it. 6.You turn RIGHT off the exit, and that takes you back under the expressway. If you don’t do this you’ll go in the wrong direction! 8.Turn RIGHT onto Albert, and then Young street is the first street you come to; turn LEFT onto it. (2)From WLU: find your way to Albert Street, which is the western border of the campus. Walk toward central Waterloo. You’ll cross Bricker, Ezra, Central, and Spring; the next street is Young - turn right. (3)From the University of Waterloo: starting from the Seagram/University entrance: at this intersection, you’ll see parking lots to the right and the left ahead of you. Take the one on the left (the ‘A’) lot) and walk from corner-to corner so far as possible (there will likely be parked cars). You emerge near the railroad track as it crosses Seagram Drive. Walk along the road parallel to the railroad until you get to a deer enclosure, on your left. Walk to just the end of it, and turn left. You’ll shortly be on a tarvia track that used to be a road; take it to the right and follow around until you see a parking lot on your right. Walk to the far right-hand corner of that lot (not very far), then follow the walkway down to the left and right by a stand of trees. The walkway connects directly with the end of the Young Street sidewalk. We are the second house you come to. RIDES: Students, take note: after a concert, you may not want to walk back in the dark. Many of our frequent-attending patrons will be happy to give you a ride if you live somewhere near campus. Just ask Jan in the kitchen before the concert or at intermission. note on buses: from campuses, walking is very likely to be faster than waiting for a bus, and cycling would be much faster. At the Concert - please give this a quick read! 1.Silence! e.g. : During the music, please do your best not to cough. (We have a stock of cough drops on hand, and kleenex. Almost all coughing is avoidable, but if you absolutely can’t avoid coughing turn and cough as quietly as possible into your sleeve.) Make sure your cell phone is Off. Our programs are deliberately minimal - don’t rattle them! Don’t wear noisy ear jewelry. We are famed among musicians for our quiet audiences. Don’t be an exception! 2.PLEASE don’t wear perfumes or colognes, or deodorants that are easily detectable by the person next to you. Many people are allergic to them, and in a small room, they’re very hard to avoid. Thanks! 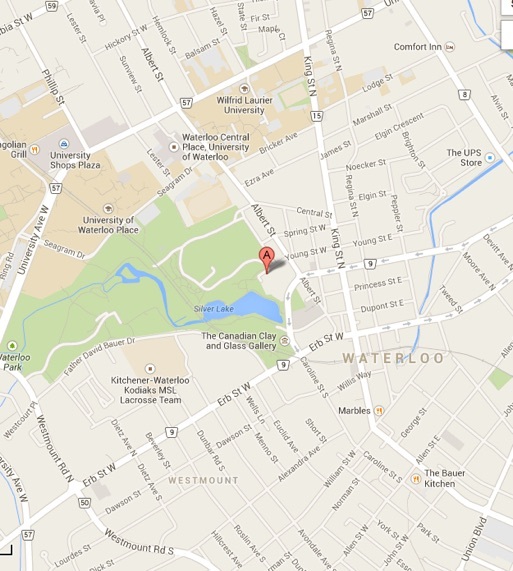 Map of relevant central Waterloo area - Red pointer locates the Music Room.